Welcome to the first lesson in the Parsi Gujarati Reader. As always, please let me know if you spot any errors or have any questions. This is very much a work-in-progress, so if you have suggestions, I'd be more than glad to hear them. Among students of Parsi and Zoroastrian history, the Pārsī Prakāś is probably the best-known Gujarati reference work. Spanning ten volumes most of which are the length of a phonebook, the Pārsī Prakāś, published between 1888 and 1973 (covering the period from 999 - 1962 AD), is a chronological history of the Parsi community in India, drawn mostly from contemporary newspaper reports. Since the Pārsī Prakāś was published over the course of almost a century, it had many editors, and the orthography of the later volumes is not the same as that of the earlier. For the most part, the orthography of the texts is modern in the usage of conjuncts, but you will notice inconsistencies even in the same excerpts (અત્રે and અતરે, પરગટ and પ્રગટ). No attempt has been made to normalize the orthography or punctuation, so before reading this lesson, be sure to read the section on script and orthography. Below are presented five typical excerpts drawn from the first three volumes, treating a variety of different subjects. 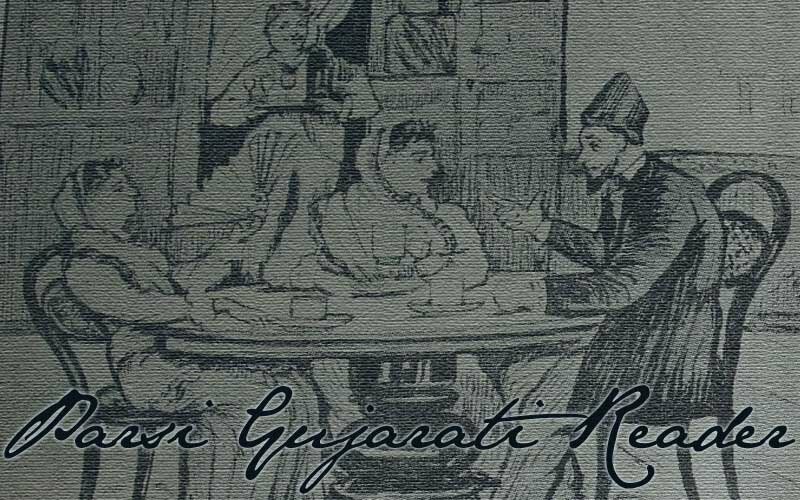 Excerpt 1, about a document granting tax exemption from the Gaekwadi government, is very typical of the earlier entries of Parsi Prakāś, which use dated manuscript material to trace the history of the Parsi community. Excerpt 2 concerns a letter written by D. F. Cama to the Evening Post about the American Civil War. Letters written by prominent Parsis in major periodicals make up many of the entries in the PP, and excerpts of the original publication are usually included in the footnotes. Excerpt 3 is an excerpt from the Mumbai Samachar about the Mazgaon Navjotes of 1882. Typically, the PP tries to stay away from entering into controversial matters. Excerpt 4 is a somewhat atypical entry concerning a hoax played on a group of Parsis by an itinerant traveler reminiscent of Prester John stories in medieval Europe. Excerpt 5 is an obituary of Kadmi high priest Mulla Firoz. PP is full of obituaries, which often contain very useful biographical information on their subjects. These obituaries were so useful that B. B. Patel, the first editor of PP also compiled Pārsī Maratyūk in three volumes, containing unabridged published obituaries of Parsis down to the year 1890. View the original pages from Parsi Prakash as a PDF to check my transcription, see the original format, and read the footnotes which have been omitted below. સવંત ૧૭૮૮ ના આશો શુદ ૧૦. આજ દીને પિલાજીરાવ ગાયકવાડે એક પરવાનો૧ કરી આપી વલસાડના મોબેદોપરની રૂ. ૨૧) ની ગાયકવાડી સરકાર તરફની વાર્ષિક ખંડણી માફ કરી હતી. ૧. આ અસલ પરવાંનો નવસારી મધે દેશાઈ પેશતનજી ખરશેદજી પાસે મોજુદ છે. ઈ. સ. = ઈસવી સને (Persian عیسوی سنه): Christian Era, A. D.
તા. = તારીખ (Persian تاریخ): date. Note: Unlike Persian, તારીખ only means date in Gujarati. For "history," તવારીખ (Persian تواریخ) is used. -મું - makes ordinal numbers. See GRG 4.2.14.2. આશો: name of the first month of the Samvat calendar. શુદ: refers to the first half of a Samvat month, while the moon is waxing (opposite વદ, referring to the second half of a Samvat month). આજ દીને: today, on this day. પિલાજીરાવ ગાયકવાડ: Pilajirao Gaekwad (d. 1732), founder of the Gaekwad dynasty, which ruled over Vadodara and Navsari as a princely state throughout the British period. પરવાનો (Persian پروانه): a written order . કરી આપવું:‌ to prepare. The use of આપવું gives the verb કરવું a perfective sense. See GRG 5.24.3-4 on compound verbs made with આપવું. વલસાડ: The city of Valsad (often Anglicized to Bulsar). તરફ (Persian طرف): direction. (in compounds) from. ખંડણી: "quit-rent," a tax imposed by an authority on freeheld or leased land; tribute. માફ કરવું (Persian معاف کردن): to forgive, exempt (tax). પાસે: (postposition, optionally preceded by -ની): in the possession of, near. મોજુદ (Persian موجود): extant. મોજુદ છે: it exists. શેઠ ડોશાભાઈ ફરાંમજી કામાજી જેઓ ઈ. સ. ૧૮૬૨માં અમેરીકાની મુસાફરીએ ગયા હતા, અને ત્યાંના લોકોની મેહનત, હુશિયારી તથા સુધારા જોઈ ઘણા ખુશી થયા હતા, તેઓએ ઉત્તર અને દખણવાલાઓ વચ્ચે ગોલાંમગીરી નાબુદ કરવાને લગતી મોટી લડાઈનું હાલ સમાધાંન થવાથી ઉત્તરવાલાઓએ દખણવાલાઓને માફ કરવા તથા પાછી ભાઈબંધી ચાલુ રાખવા વિષે પ્રોપકાર બુધીથી એક સુચનાનો પત્ર અતરેથી તા. ૨૩મી જુલાઈ ૧૮૬૫ ને દીને લખી તે ત્યાંના પોતાના આડતીઆની મારફતે આજનાં "ઈવનીંગ પોસ્ટ"ના આંકમાં પ્રગટ કરાવ્યો હતો, તથા મરનાર પ્રેસીડેંટ લીનકનની એક મોટી તસવીર ખરીદવાને ૫૦૦) ડાલર મોકલ્યા હતા. શેઠ: Seth, a merchant (from Sanskrit śreṣṭhin- "a distinguished man"). જવું (past participle: ગયું): to go. મેહનત (Persian محنت): labor, effort, tribulation. નાબુદ કરવું (Persian نابود کردن): destroy, annihilate. હાલ (Persian حال): condition. (adv.) now, at present. ચાલુ: current. ચાલુ રાખવું: to renew, keep current. મારફત (Persian معرفت): agency. મારફતે: on behalf of. ઈવનીંગ પોસટ: The Evening Post. પ્રગટ કરવું: to publish, પ્રગટ કરાવવું: to get published. તસ્વીર (Persian تصویر): picture, portrait. ખરીદવું (Persian خریدن): to buy. અત્રેના કેટલાક જરથોસ્તીઓએ શેઠો નવરોજી નશરવાંનજી વાડીઆ અને નાનાભાઈ ધનજીભાઈ બનાજીની આગેવાની હેઠલ પોતપોતામાં એક ઉઘરાંણું કરી મજગામ તરફ રેહનારાં જુદદીન ઓરતઓને પેટનાં નવ જણાંને શુદરેહ કુસ્તી પેહરાવવાની ક્રિઆ આજ દીને કોટ મધેની મરહુમ માણેકજી શેઠવાલી વાડીમાં દસતુર જામાસપજી મીનોચેહરજી જામાસ્પ આશાના, તેવણના દીકરા એ. ફીરોજજી દસ્તુર જામાસપજી, દસ્તુર જમશેદજી શોરાબજી કુકાદારૂ, અને એરવદો ખુરશેદજી મીનોચેહરજી કટેલી, કાવશજી માણેકજી કાતરક, ખરશેદજી રૂસતમજી માડન, રૂસતમજી બરજોરજી રાંનજી, દાદાભાઈ ફરાંમજી પાવરી, અને હોરમજજી ટેહમુલજી જામાસ્પઆશાના પાસે કરાવી હતી. આ વેળાએ દસ્તુર પેશોતનજી બેહરાંમજી સંજાણાએ એક હેંડબીલ કાઢી આ ક્રિઆ ઘટતી રીતે કરવામાં આવી છે એવી તેમની ખાતરી કરવામાં આવે નહી ત્યાં સુધી એ શુદરેહ પેહરનારાઓને મરહુમ શેઠ હોરમજજી વાડીઆવાલાં આતશબેહરાંમમાં આવવાથી દુર રહેવાની એલતેમાસ કીધી હતી. આ બનાવ માટે પારસી કોમમાં જેમ ઘણાઓ તરફેણ તેમજ વીરૂધ પણ હતા. (મુંબઈ સમાચાર, તા. ૨૭મી જુન ૧૮૮૨). શુદરેહ કુસ્તી પેહરાવવું: to make wear the sudreh and kustī, i.e., perform a navjot ceremony. મરહુમ (Persian مرحوم): the late. એ. = એરવદ: a Parsi priest who has had the nāvar and marātib rituals performed. કરાવવું: to have (something) done. કાઢવું: to bring out, drag out, take out. કરવામાં આવી છે: should have been done. ખાતરી (Persian خاطری): belief, conviction, opinion. ત્યાં સુધી: as long as that. Used as a conjunction "until …" when the preceding verb is in the negative. આતશબેહરાંમ (Persian آتش بهرام): ātash-behrām, the highest grade of Zoroastrian fire temple. દુર રેહવું (Persian دور): to stay away from. એલતેમાસ કરવું (Persian التماس کردن): to ask, entreat. માટે: (postposition) because of, as a result of. તરફેણ (Persian طرفین): taking sides, partisanship. આએ અઠવાડીઆંમાં મુંબઈ મધે એક મુસલમાંન નામે હાજી શઈઅદ હોસેન અતરેના જાણીતા મગોલ વ્યાપારી આગામહમદ રહીમ શીરાજીને ત્યાં આવ્યો હતો. તેણે અતરેના પારસીઓમાં એવી વાત ચલાવી કે "હું ઘણાંએક મુલકો ફરતો ફરતો આવેઓ છેઉં, અને માહરૂં વતન શ્રી ખતાઓ ખોતન છે. તાંહાં રાજ જરતોશતીઓનું છે. તે લોકો કાંઈ આતશને માનતા નથી, તે જાતે ઈઅજદાંપરશત છે, પણ આતશને કીબલો જાંણેચ, અને તે વાશતે ઘણા આતશકદેહ બનાવેલા છે. તાંહાંના પાદશાહનું નામ ગોશતાશપ બહમન કરી છે, અને તેનાં પાએતખતની જગો ખાંનબાલેક નામનાં શેહરમો છે. તેહનો મુલુક ઘણો મોટો છે અને શલતનત દબદબા ભરેલી છે કે તેવી સલતનત હુંએ ઈરાંનના પાદશાહનીબી નથી જોઈ. અને તાંહાંના રેહેવાશી જરતોશતીઓ મોટા હોનરવાંન છે અને તે પાદશાહ લશકરબી મોટું રાખેચ. અને તે લોકોનાં ડુંગરો પર દખમાં છે અને મુએલાં લોકોને તાંહાં અવલમંજલ પોંચારે છે. અને જેઆરે માંણસ મરેચ તારે ઉજરાં કપડાં પેહરાવેચ. તે લોકો ગોશત ખાતા નથી. તે મુલકમો જે કોઈ મુશલમાંન લોકો વશે છે તેણાંને પાશેથી જજીઓ લીએ છે. તે લોકોની જુબાન જંદ ઓ પાજંદ છે અને તે શિવાએ તુરકીબી બોલે છે." આ વાત અતરેના ઘણા પારસીઓએ સાચ્ચી માની, અને ખુદ પેલા શઈઅદને મોઢેથી એ બાબેની સઘળી વીગતવારે પુછપરછ કરવાને આજ દીને શેઠ જમશેદજી જીજીભાઈની માહલક્ષમીની વાડીમાં કેટલાએક જરતોસ્તીઓ એકઠા મલ્યા હતા, તે સાથે મગોલ, મુસલમાંન, વગેરે બીજી જ્ઞાતના કેટલાક સાહેબો પણ હાજર થયા હતા. તેઓ સર્વેએ મજકૂર શઈઅદને ઘણાક સવાલો પુછયા, અને તેના ઉતર સાંભળી લઈ એવું ઠેડવ્યું કે "એ ધણીની કહેલી વાતને શાબેત કરવા સારૂં તે દેશની પડોશમો જે દેશ શોડે આવેલો હોએ, અને જાંથી એ બાબેની ખબર નીકલી શખે તાંહાં કાગજ લખીને જવાબ મંગાવવો તથા એ ધણીનેબી કાગજ લખી આપવો." મગોલ (Persian مغول): Mogul. In the nineteenth century, this word almost always refers to Iranian travellers and migrants. -ને ત્યાં: the house of. વાત ચલાવવું: to discuss, carry on conversation. મુલક (Persian مُلک): land, kingdom. ફરવું: to travel. ફરતું ફરતું આવવું: to arrive after many travels. છેઉં: typical Parsi form of the first person singular copula (MSG છું). See skeleton grammar. માહરૂં: MSG મારું "my". See skeleton grammar. શ્રી: often introduces proper nouns. With names it can often be translated as "Mr."; with places, it is best left untranslated. ખતાઓ ખોતન (Persian خطا و ختن): Cathay and Khotan (a fabulous name for China). તાંહાં: there. MSG ત્યાં. See skeleton grammar. લોકો: people. તે લોકો: they. માનવું: to worship, to believe. ઈઅજદાંપરસત (Persian یزدانپرست): God-worshippers, i.e., monotheists. કીબલો (Persian قبله): qibla, the direction of prayer. વાશતે (Persian واسطه): (postposition) as a result of. આતશકદેહ (Persian ): fire temple. જગો (Persian جایگاه): location, place. ખાંનબાલેક (Persian خانبالق): Khanbaliq, the Turkic name of Beijing. મુલુક: an error for મુલક. શલતનત (Persian سلطنت): kingdom, Sultanate. -ભરેલું: when added to a noun, it makes an adjective usually in the sense of English -ful. હુંએ: an emphatic use of the subject pronoun plus the agentive marker, emulating speech; normally મેં before an ergative verb. -બી / ભી: even (emphatic particle). દખમું (Persian دخمه): a Tower of Silence. મુવું: to die. મુએલું: deceased, dead. અવલમંજલ (Persian اوّل منزل): resting-place, cemetary. પોંચારવું (for પોંચાડવું): to convey, causative of પોંચવું 'to reach'. જએઆરે / જારે / જ્યારે ... તેઆરે / તારે / ત્યારે: when ... then. જજીઓ (Persian جزیه): jizya, poll-tax. લેવું (3rd present લીએ/લે છે): to take, collect. જંદ ઓ પાજંદ (Persian زند و پازند): Zand and Pazand. શિવાએ: (postposition) in addition to. ખુદ (Persian خود): my/your/him/her/it/our/your/them-self/selves, reflexive pronoun. એકઠું મલવું: to assemble together. હાજર થવું (Persian حاضر شدن): to be present. ઠેડવવું (for ઠેરવવું): to settle. Causative of ઠેરવું 'to stop'. શાબેત કરવું (Persian ثابت کردن): to prove. સારૂં: (postposition) for, for the sake of. (adjective) good. શોડે: (postposition) by the side of, near, according to. કાગજ (Persian کاغذ): letter, paper. ઈ. સ. ૧૮૨૬-૨૭માં મુંબઈમાં કબીશાને લગતી તકરારમાં કદમીઓ તરફના મુખ્ય આગેવાંન તથા તકરાર ચલાવનાર એવણ હતા, અને તે વખતે એવણને નાણાં સંબંધી મોટું નૂકસાંન ગયું હતું. એવણ તે વેળાની મુંબઈની પારસીની પંચાતના પણ એક અકાબર ઠડેલા હતા. એવણે પોતાનાં મરણ અગાઉ પોતાનું કીમતદાર કેતાબખાંનું જે મધે ફારસી, અરબી, તુરકી, નજુમની તથા જંદ, પાજંદ પેહલવી અને અંગરેજીની કેતાબો હતી તે પોતાને હાથે લખીને કદમી અંજુમનના સાહેબોના સ્વાધીનમાં આપી હતી જે "એ કેતાબખાંનાં ઉપર હમારા વારેશોનો કંઈજ દરદાવો પોહોચે નહી, અને એ કેતાબખાંનું હમારે નામે શરવે કોમના દાનાવોને વાંચવા થકી જાહેરાતમાં રાખવું." એ વશીહત મૂજબ એવણનાં મરણ પછી સઘળી કેતાબોનું એક લીસ્ટ મોબેદ ફરદુનજી મરજબાંનજી પાસે કરાવી કદમી આગેવાંનોએ પોતાની દેખરેખ હેઠલ તે "મુલ્લાં ફીરોજ કેતાબખાંનાં"ને નામે સર્વે લોકોને વાંચવાને માટે ખોલ્લું રાખ્યું હતું. તેમજ ઈ. સ. ૧૮૫૪માં એવણની ગાદીના વારસ દસ્તૂર રૂસતમજી કેકોબાદજીનાં મરણ તાંકણે અતરેના જરથોશ્તીઓએ એવણનાં નામની યાદગારીને માટે "મુલ્લાં ફીરોજ મદરેસા" નામની જરથોશ્તીઓના છોકરાઓને જંદ, પેહલવી, અને ફારસી શિખાડવાની એક મકતબ સ્થાપી હતી. ક. = કદમી: The Kadmi month is one month ahead of the Shahanshāhi month (so Roz 7 (Amardād) Māh 2 (Ardibeheśt) Kadmi corresponds to Roz 7 (Amardād) Māh 1 (Farvardin) Shahanshāhi). મુલ્લાં (Persian ملا): a learned man. બીન (Persian ابن): son of. કદમી (Persian قدیمی): Kadmi, a minority Parsi group who chose to rectify their calendar with that of their Iranian coreligionists in the mid-18th century. While small in numbers, their members included some of the most influential Parsis on the 18th and 19th centuries. મરાતેબ (Persian مراتب): the second grade of initiation into the Zoroastrian priesthood (preceded by the નાવર). ફારસી (Persian فارسی): Persian language. આરબી (Persian عربی): Arabic language. પુખ્ત: complete, full (literally, ripe). દીને ખેરદે મનજુમે for Persian : The versified Wisdom of the Religion, Mullā Fīrūz's Persian travelogue. બાદ (Persian بعد): (postposition) after. શિખાડવું: to teach, causative of શિખવું to learn. દશાતીર (Persian دساتیر): The Dasātīr (see the Guide). પુરું થવું: to be complete. મી. વિલ્યમ અરસ્કીન: Mr. William Erskine. તમામ કરાવવું (Persian تمام کردن): to get completed. છપાવવું: to get printed, causative of છાપવું (Persian ). ઘણુંખરું: for the most part. તકરાર (Persian تکرار): quarrel, controversy. તકરાર ચલાવવી: to quarrel. ઉભું કરવું: to concoct; to build. બાહોશી (Persian با هوشی): intelligence. ફેરદોસી: Firdawsī Tūsī (فردوسی طوسی), the author of the Persian Book of Kings. શાએરે ઈરાંન (Persian شاعر ایران): the poet of Iran. બેત (Persian بیت): a line of poetry composed in Persianate style, as opposed to a line of poetry composed in an Indic meter. શાહનામું (Persian شاهنامه): The Persian Book of Kings. મૂજબ (Persian موجب): (postposition) like, according to. જારજનામું (Persian جارجنامه): The Georgenāma (see Guide). શરૂ કરવું (Persian شروع کردن): to begin. અરજ કરવું (Persian عرض کردن): to petition, present. મુસારો (Persian مشاهره): monthly wages. ભત્રીજો: son of one's brother, nephew. બાહેર પાડવું (Persian باهر): to put out, publish. કબીશો (Persian کبیسه): the kabīsa, the addition of an intercalary month every 120 years about which a controversy raged between Shahanshahi and Kadmi Zoroastrians in the 18th and 19th centuries. નૂકસાંન (Persian نقصان): loss. નૂકસાંન જવું: to incur a loss. પંચાત: Panchāyat. The Bombay Pārsī Panchāyat is a trust fund which functions to a certain degree as the governing body of the Parsi community. અકાબર (Persian اکابر, but note that this is not used as a plural in Guj. ): great man, dignitary; roughly translatable as "Leader or "Manager". અંજુમન (Persian انجمن): anjuman, an assembled group of Zoroastrians. સાહેબ (Persian صاحب): master, great man, "big shot." દરદ (Persian درد): pain, effort. દાના (Persian دانا): knowledgeable person. થકી: (postposition) from, out, by. Worked through everything? Congratulations! Check back soon for Lesson 2! If you want to check your translations, click here.